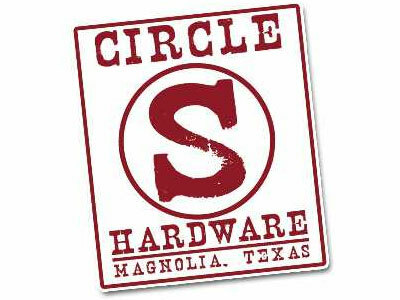 At Circle S Hardware, we carry ACCO and Showmaster feeds as well as lumber, culverts, and propane gas. From plumbing supplies to U-Haul rentals, we're serious when we say we are "way more than a hardware store." Come by and see us! Have a question? Call us at 281-356-7970 or email us here. Don't have time to stop by? Call us and we will deliver whatever you need. The Circle S staff is trained to answer all of your questions and serve you in a number of ways. We cut keys and can also duplicate “hi-tech” auto keys. We mix paint. We will show you how to fix that sink or toilet even if we have to talk you through it once you get home. Our sharpening service includes knives, saw blades, chain saw blades, scissors, pruners, looping shears, hair shears, and more. We fill propane cylinders, forklift bottles, and motor fuel. • Concrete“RCP” Culverts - We stock 12”, 15”, 18”, and 24” concrete culverts in 4ft lengths. Larger sizes and lengths are available upon request or for special order. • Poly “HDPE” Culverts - We stock 6”, 8”, 10”, 12”, 15”, 18”, and 24” double wall poly culvert in 20ft lengths. Larger sizes and lengths are available upon request or for special order. • Galvanized “Tin Horn” Metal Curvets – Sizes 6” and up, in lengths from 16ft to as long as 40ft are available upon request or for special order. • Culvert Accessories - All types of catch basins, clean outs, saddles and grates, man holes, curb inlets, and safety end treatments “S.E.T.’s” in both open and with bars in a 3/1, 4/1, and 6/1 configuration are available. Note: we suggest contacting your county precinct office and home owners association for prior approval of all culvert sizes before buying and/or burying any culvert and remember, always call 811 before you start any digging project! • Septic - Septic tanks from a 45 gallon grease trap, 200 gallon old style, 300 gallon old style, 500 gallon approved A, and 500 gallon approved B all in stock. Larger sizes are available such as 750 gallon, 1000 gallon and even a 2000 gallon. Septic tank lids in stock include the 45 gallon, 200 gallon, 300 gallon, and 500 gallon tanks, larger sizes are available. • Plumbing - We stock PVC in 1/2”, 3/4”, 1”, 1-1/4”, 1-1/2”, 2”, 3”, and 4” schedule 40 as well as, 1/2”, 3/4”, 1”, 1-1/4”, 1-1/2”, and 2” schedule 20 in 20ft lengths. We invite you to come by or call us if you have questions about our products. If we don’t have it, we will get it. If we can’t get it, they don’t make it. And if you can’t pick it up, we will deliver it. Call us at 281-356-7970 or email us here. At Circle S, we carry ACCO and Showmaster feeds as well as lumber, culverts, and propane gas. From plumbing supplies to U-Haul rentals, we're serious when we say we are "way more than a hardware store." Come by and see us! Have a question? Call us at 281-356-7970 or email us here. Don't have time to stop by? Call us and we will deliver whatever you need.